The other day I was looking through my Taste of Home Healthy Comfort Foods cookbook and came across a recipe for a healthy chili. But since I was missing some ingredients, including ground beef, I decided I’m improvise my own version. After digging through my pantry and fridge, I came up with this bad boy. Enjoy! 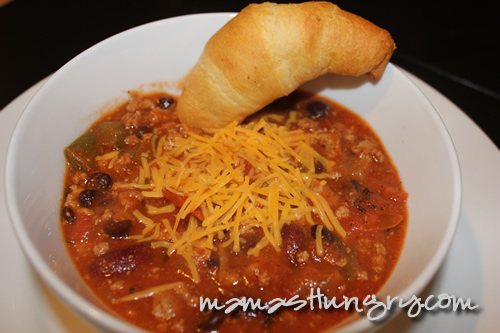 This healthier turkey chili is easy to make and oh so yummy. In a dutch oven over medium heat, cook the ground turkey, and veggies until the meat is no longer pink. Drain the mixture and return to heat. Stir in the water, tomato sauce, diced tomatoes, beans and seasonings. Bring it to a boil for about 2 minutes and then reduce the heat. Cover and simmer for 45 minutes. Garnish with reduced-fat shredded cheddar or 1 tablespoon of sour cream. For the chopped bell peppers, you can use 1 medium pepper, or do what I did. 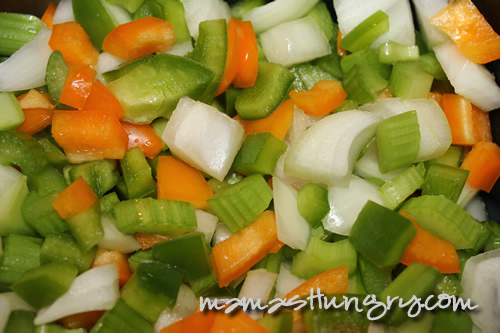 I used 1/2 an orange bell pepper and 1/2 a green bell pepper. I think it adds some nice color that is usually lacking in chili. 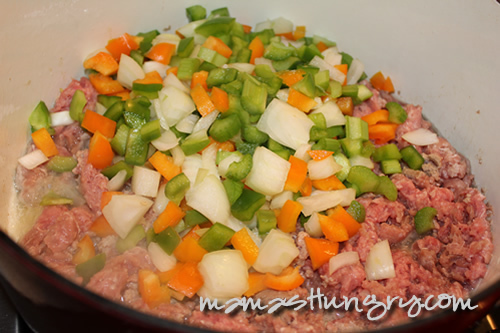 Add the ground turkey and then toss the veggies on top. 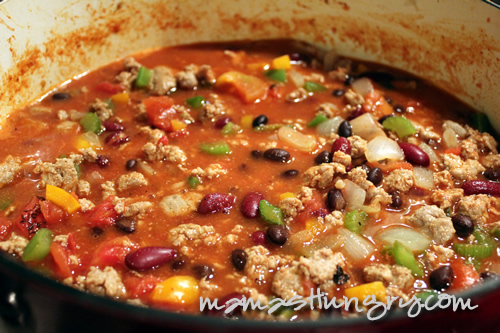 After you drain the meat and add in all the other ingredients, it will start to look like chili! Let the mixture simmer for 30-45 minutes or until it starts to look thicker. When it’s done, you can serve it up with reduced-fat shredded cheddar or sour cream. I used cheddar and added a low-fat crescent roll to dip. Yum! How do you get your food pictures to look so good? I need to make more chili — I never think about making it, but, whenever I have some, I always think about how good it is . . . and I used to make really, really good chili. Glad you think they look so good! I use my Canon Rebel and try to zoom in as close as I can without risking steam touching the camera. I also open all the blinds in the kitchen and turn on all the lights, especially the light above the stove. Having all the lights on means I don’t have to use the flash, which typically washes out the yummy details and texture of the food. I love this new recipe. 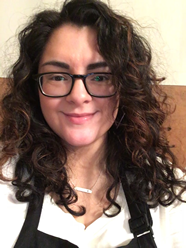 Another delicious recipe from mi amiga! I love kidney beans! We are trying to do more meatless meals…do you think subbing the meat for more beans would make up for it? Yes! Actually, I used part of a vegetarian recipe to come up with this one. It included black beans, northern beans and two cans of red kidney beans. You might want to also include a small can of tomato paste so that it thickens a little better. Girl, I think I love chili. Or maybe it’s just your chili. This recipe came out pretty darn awesome.